The British government have confirmed today that Royal Mail is to be privatised within the next few weeks. The privatisation is required under the EU Postal Service Directive that effectively bans state-owned postal services. It was this directive that opened up the postal service to competition, depriving the Royal Mail of the profitable business mail and leaving it with a virtual monopoly on the largely unprofitable residential mail which it is required to deliver by law. It is the law - it's an Act of Parliament that was passed two years ago and only Parliament could ever change that. It was the law that the Royal Mail was publicly owned and Parliament has passed a law allowing it to be privatised in accordance with an EU directive. It was also the law that the Royal Mail had a monopoly on postal services and Parliament has passed a law allowing companies to come in and cherry pick the profitable parts of the postal service to compete against them. 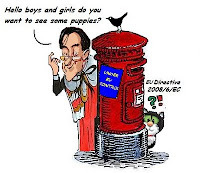 Parliament is quite happy to legislate against the interests of the Royal Mail on the instructions of the EU, why should an Act of Parliament reassure us?